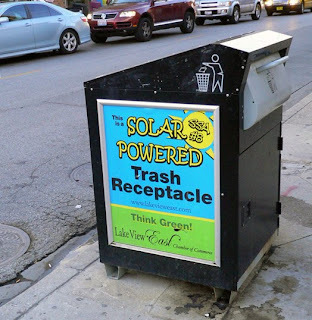 I was in Chicago this past Labor Day weekend and while walking around the Millennium Park area, saw a solar-powered trash compactor. The city first started using them in the beaches. Called Big Belly, once trash reaches the top of the cans, it breaks an electronic beam that triggers a motor to mash the trash. The device doesn’t need direct sunlight. They cost almost $4000 each. Chicago currently has 90 of these compactors. Kudos to Mayor Richard Daley for continuing his efforts to make the Windy City the greenest city in the U. S.